Interned at DC General Hospital in Washington DC then attended the US Navy School of Aviation Medicine at Pensacola, FL achieving Naval Flight Surgeon status in 1957. Joined the US Navy Medical Corps in 1958 and earned his wings at Beeville,TX in 1962. May-June 1973, Science Pilot on the first manned orbital space station mission for NASA he assisted crewmates Pete Conrad and Paul Weitz in station repairs and a multitude of experiments during 4 weeks in space. 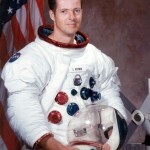 After Skylab 2 served as Chief of the On-Orbit Branch of the Astronaut Office working on the Shuttle Program. 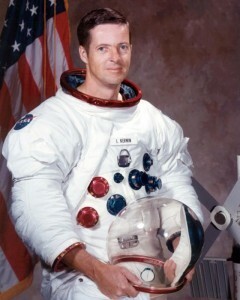 1982-83, NASA Senior Scientist representative in Australia. 1984-87, Director of the Space & Life Sciences Directorate at JSC. 1987-90, worked in conjunction with Lockheed as Manager, Extravehicular Systems Project. 1990-93 Served on the NASA Advisory Council and from 1990-94 was Manager of the NASA Human Transportation Study Group. 1994-95 Lead of the liason group for Lockheed-Martin. June 1996, joined Systems Research Laboratory(SRL) as a Program Manager. 1997, Joined Krug Life Sciences which became Wyle Laboratories, El Segundo CA in 1998. Also served on the Board of Directors of the National Space Biomedical Research Institute in El Segundo.